But when children use these devices in the evening, they can struggle to sleep, leaving them wired and tired. They may also have difficulties with staying asleep if these devices disturb them throughout the night. Why worry about missing a little sleep? Research reveals that 20-40% of school-aged children are affected by inadequate sleep. Inadequate sleep can be caused by not getting enough sleep each night, or by having sleep that is broken and disturbed. While the amount of sleep needed varies between individuals, as a guide, primary school children should get between 10 and 12 hours of sleep each night, dropping to 8 to 10 hours for adolescents. Poor sleep can have a negative impact on a child’s health and wellbeing, mood and behaviour, as well as their concentration and memory. This can lead to academic, social, emotional and behavioural problems at school and home. If you think that your child is not getting enough sleep, look for signs such as moodiness, behaviour issues, poorer health and problems with memory and attention at home or school. Children who are experiencing problems at school as a result of poor sleep may become anxious. This may then make it more difficult for them to get enough sleep each night. The screen brightness – the light emitted from digital screens can fool the brain into not realising it is nighttime. Electromagnetic radiation from the devices disrupts the release of melatonin, a hormone that helps regulate sleep. (Edited to add: this is contentious, inconclusive, and still being researched). 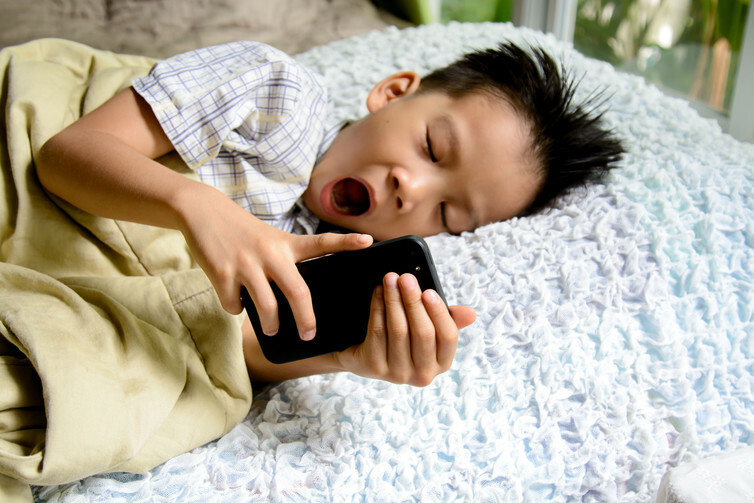 The excitement of the content (be it video games, television shows, or messaging friends via social media) can induce a “fight or flight” response that inhibits the onset of sleep or prevents a deep restful sleep. Over time, these may reset the child’s body clock so that it moves the sleep onset time to later in the evening. That leads to a sleep deficit and increases the likelihood of problems. Setting a down time for technology is good for sleep routines. Changing the sleeping environment by removing technology from the bedroom sets the scene for a good night’s sleep. Establishing healthy bedtime routines and setting limits on the use of technology in the evenings can prevent the development of technology-induced sleep problems. No devices in the bedroom. This creates a bedroom atmosphere conducive to rest. Having a consistent nighttime routine. For younger children, develop a bedtime routine that includes between half an hour to one hour of quiet activities before bed, such as the three Bs routine – bath, book, bed. This will set them up with good habits as they get older. Balancing kids’ daily screen time with exercise and outdoor time helps tire them out physically to ensure deep sleep. Setting a down time for their technology. Have the devices go on charge at a specified time each night, in a public spot in the house. Not only is this good for sleep routines but it ensures that the devices aren’t in the bedroom for the wee hours of the night when cyberbullying is most likely to occur. For older children, discuss the implications of the use of their devices with them. 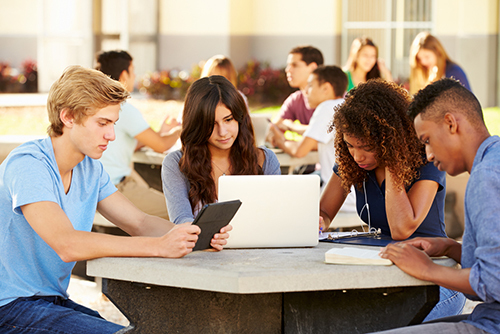 Risks for pre- and early teens include bullying, and device addiction. While research on the impact of mobile devices and brain health remains inconclusive, the long-term effects of radio frequency waves and electromagnetic fields on the cognitive ability and the health of adolescent brains is under investigation. Device addiction can be an issue as teenagers depend on their technology to stay connected to their friends – often only finding time to socialise late in the night. This can be due to an often hectic daytime schedule of school, work and sporting commitments. Messaging friends, and sharing on social media, is often a source of sleep problems for this age group. To avoid such problems, get them to help you develop the rules for the use of their devices, with an emphasis on balance rather than prohibition. Given the increased importance for this age group of technology for socialising and learning, helping them find balance will not only help with sleep but ensure that their use of technology is a positive rather than negative influence. Great article.It’s super important info for parents- Bedtime routines are such a struggle for many families. Very useful!